Last summer my family began an unwanted journey: We learned that our son suffers from the disease of addiction. The realization shocked and panicked us, so we dove right into “fix-it” mode, quickly calling a couple of physicians and rehab facilities. We took him to the local hospital for a drug test, where doctors told us that addicts will always lie to protect their habit. We learned just how true that is when the test came back positive for three substances. He had admitted to just one. After doing some research, we made a decision on a rehab facility. The next morning we were to arrive bright and early. I was a nervous wreck. When we arrived, the staff immediately searched our son’s bags. This set the tone for what was to come. Many prideful hopes and dreams were beginning to evaporate. We had asked for vision and here it was. I wasn’t entirely sure how we’d gotten here and I certainly didn’t know how to change course. I kept looking at my son differently than I ever had before. Prior to this chapter in his life, I imagined him as my little boy. I could still see his 4-year-old face smiling at me. Now I saw a deeply troubled young man who had been to a dark side of life that no parent ever wants their child to see. This was a thought I could not make go away. Those first few days were utter chaos. It felt like a tornado was swirling above us. The funnel was filled with regrets, fears, the ripple effect, prideful worry of what others would think and a feeling that this was bigger than we could handle. I lived in a state of panicked prayer, impatiently waiting for the storm to pass. I hadn’t considered the cleanup that needs to follow the storm. I would soon discover that I had a lot to learn about what needed cleaning up and how difficult the job would be. We started family counseling. This began with our learning about addiction as a disease. 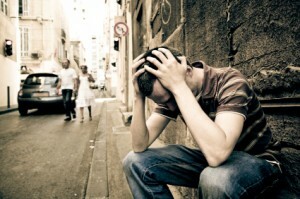 Addiction, we found out, is a physical dependence that results when substance abuse changes the chemistry of the brain. The addict feels the same intense desire for their drug of choice as we feel for food when we are hungry, water when we are parched and air when we can’t breathe. We were shown PET scans of the normal brain and that of an addict. (The acronym stands for positron emission tomography, an imaging technology that shows how tissues and organisms actually function.) We could see that the brain activity of an addict is markedly different than that of someone not using drugs. We learned how treatment has evolved over the years. Next we began acquiring a whole new vocabulary of words I thought I already understood. It turned out I hadn’t even scratched the surface of words like enabling, detachment and dependence. I couldn’t be enabling. I would not knowingly help my son purchase drugs. But he drove our car. We paid the bills on his cell phone. He lived at home and worked for my husband. Did any of these things help him to grow up and get better — or did they enable him to continue his habit? We thought we could fix his problems by setting him up for success, but all we did was allow him to avoid the consequences of his actions. We had to detach from his problem and let him face its causes and effects. Over time, our family had become dependent on his successes or failures to define our happiness. We had to learn to separate our lives and happiness from the addict and learn to find it from within. Meetings were recommended with Al-Anon, a support group for families of alcoholics and addicts. It was at Al-Anon that I began to find God’s strength. I showed up for the first meeting with every muscle of my body ready to snap like a tightly twisted rubber band. I left a lot more relaxed. The group surprised me by not advising me. Instead, they listened and prayed. They shared stories and examples. They handed me tissues, patted my arm, hugged me and told me to come back. “God grant me the serenity to accept the things I cannot change, the courage to change the things I can, and the wisdom to know the difference.” This prayer is the basis for real recovery. Next we read the 12 steps. Step one of AA and Al-Anon says, “We admitted that we were powerless over alcohol, that our lives had become unmanageable.” The word alcohol can be replaced with drugs or my son’s addiction or any other thing that makes your life unmanageable. This step is the most difficult to accept. I understood that my son had lost his power over his addiction, had lost his free will in this area of his life. But I couldn’t quite accept that I had lost my power to fix his problems. So I kept trying. I decided I could make sure he went to meetings. I could keep an eye on him. I could do things to help him succeed so he wouldn’t need drugs anymore. Only slowly did I grasp that the problem was not mine to fix. It was my son’s. It takes time to let go of what I think the addict should do and focus, instead, on what I have control over. It takes time to realize that, by hanging on, I am saying, “I don’t trust God with my son.” That sounds awful, but my actions spoke those very words. It takes time in prayer — with the focus on me, discerning what God would have me do — to begin to unravel his will for me. As time went on, our understanding grew and we started to suspect a relapse. My husband and I decided on some boundaries (another thing we have control over). If our son relapsed, he would lose his car and his job. We decided to let him keep his phone in case he needed us. He did relapse and we enforced our rules about boundaries. He refused treatment, moved out and began searching for a job. This experience is so frightening. We are sending him back to “that world” in an effort to eventually get him back. But we still had communication with him. We bought him groceries because we didn’t want him to starve before he got a job. After much worry, my husband consulted with a counselor, a recovered addict. The counselor said, “You guys are still enabling him.” Cutting support means cutting support. You should also tell him not to talk to you until he is ready to get help. My husband and I discussed this advice and decided to follow it. The next day I spent about an hour canceling his phone service even though the contract wasn’t up. This was a lengthy process and my hands shook the entire time. I had to humbly explain the situation to the operator so that the phone could be cut off that day. She was so kind. I left my husband’s office and began driving home. My son called. I wasn’t nervous at all. God gave me the strength and courage to turn my son away. He gave me the wisdom to know that it was addiction that I was turning away and not my son. He gave me an amazingly peaceful heart and a hopeful soul for the first time in such a long time. This is a journey. I will say that over and over. Relapse is neither good nor bad. It is a lesson for my son and me, from God. It is a reminder that we are both powerless. It is a reminder that, when we try to take on God’s job, our lives become unmanageable. I am beginning to trust God with my son. I had to get to know myself to learn what that really means. But I doubt that I would have understood if my journey hadn’t taken me through my own personal Gethsemane. It is ever easier to trust with each step I take, blindly walking with our Lord. Thanks be to God for this lesson.